An oil sands leak which started in the summer of 2013 at the Primrose oil sands field in Alberta is not over, according to a report by Reuters. Steve Laut, president of Canadian Natural Resources (TSX:CNQ) – the company behind the operation – told the news agency that there is still a "low rate of seepage," about "one cubic metre squared per day." Laut said the leak will be stopped shortly and that it won't have an impact on production. The Alberta government has served Canadian Natural Resources (CNRL) with two environmental protection orders related to the Primrose leak. The orders stipulate that the company must drain the affected water body, clean up the sites and determine the cause of the leaks. In November the President of CNRL told the Canadian Press that the bitumen leak was "totally solvable" and that cleanup was about 80% complete. The Alberta Environmental Regulator and CNRL don't agree on what might be causing the spills. The environmental watchdog says it could be "geological weakness." CNRL says that several legacy wells could be to blame. Earlier this month the regulator investigated another leak from a CNRL well. 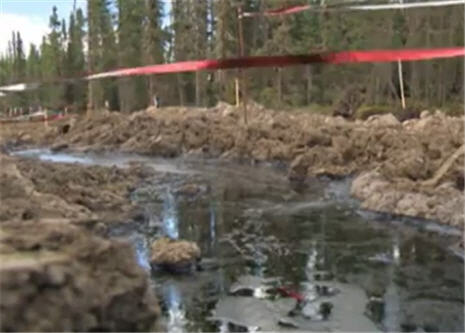 The agency said 27,000 litres of crude bitumen were released underground on January 3 at the Primprose field, Global News reported. The leak was stopped and an agency spokesman told reporters that a failed well casing was to blame.